Stevens said his discussions with Isaiah yesterday weren't about hoops, they were about how hard it is to speak at a funeral. Stevens sticking with Gerald Green in starting lineup because he liked how that group flew around defensively and was quick to ball. Scott Brooks dismisses Cs/Wiz beef lingering: "It's not gonna be 90s basketball. Those days are done and they're not coming back thank God." If you aren't following @CandaceDBuckner for #Wizards insight, you should be. 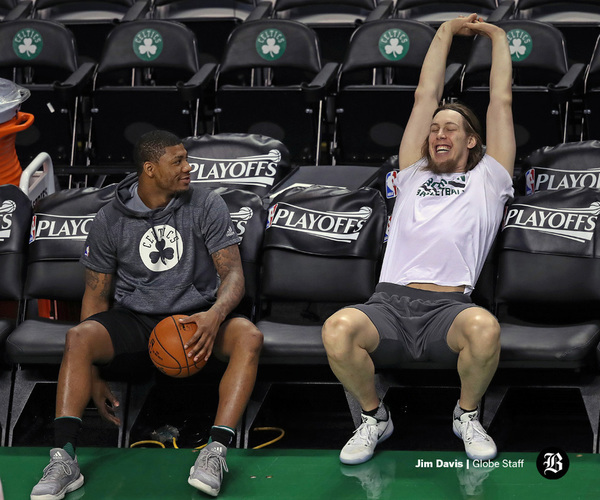 Marcus Smart and Kelly Olynyk share a laugh before pregame warmups at TD Garden. The Wizards averaged 25.2 ppg in transition in the 1st round. Celtics allowed an average of 12.7 in transition. Something's gotta give. Lots of empty seats at the start. Tickets online were selling for way under face value. The trouble with the quick turnaround. This place is capital 'Q' quiet as #Wizards jump to a 9-0 lead in less than 2 minutes. 1:46 in and it's 9-0 Wizards. Sleepy Garden feels like a sleepy Tuesday night game in December. #Wizards punch first, get out to a 9-0 lead. Look comfortable. #Celtics look rusty. #Wizards don't mind the quick turnaround, obviously. This crowd, desperate for something to help them let loose, has turned all the way up after Thomas's consecutive 3s. Thomas with back-to-back threes and it's 22-11 WSH. Isaiah Thomas took a shot to the mouth, may have knocked tooth loose. Thomas had one of his front teeth knocked out. Big gap there. During a stoppage, Thomas actually picked the tooth up near the Wizards 3-point line and gave it to trainer Ed Lacerte. Isaiah Thomas is headed back to the locker room. Isaiah and Olynyk are 5 for 5 from three and have 22 of the Celtics' 24 points. Rest of the team is 1 for 10. Good job by Otto to hold his own while Kelly Olynyk tried to post him up but instead, just ended up traveling. End 1st: #Wizards lead 38-24. Porter, Beal, Wall all have made three field goals. Gortat leads with 9 pts, 3 offensive boards. #Celtics get punched first, trail #Wizards 38-24 after 1Q. Thomas 12 (and 1 lost tooth), Olynyk 10; Gortat 9, Beal 8, Wall 7, Oubre 6. Scott Brooks called timeout to get out of that Bogdanovic/Olynyk mismatch. 17-4 #Celtics run and BOS is within 40-37 with 8:45 left in 2Q.